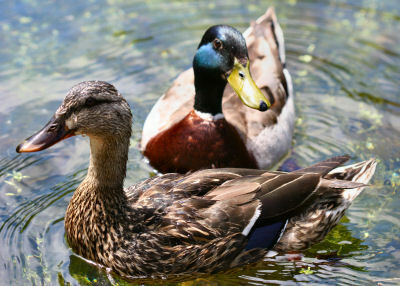 Mallards, though common, are often overlooked. Many birders consider them a “trash” bird, that is, one that is so common that they are hardly worth taking the time to study or appreciate. 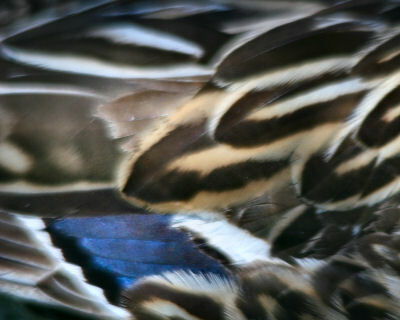 This is unfortunate, as the gaudy green of the male Mallard is certainly worth looking at and is matched in its brilliant beauty by the subtle plumage of the female. 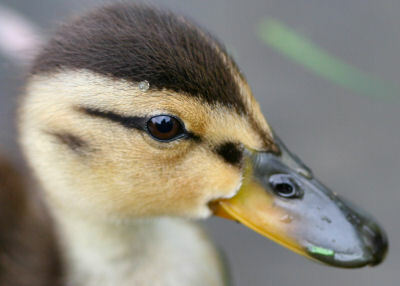 And is anything cuter than a Mallard duckling? 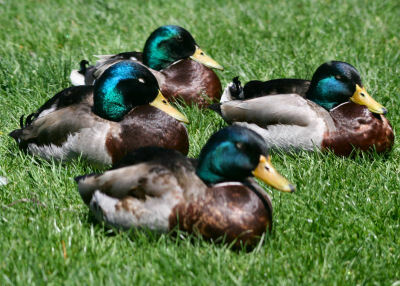 Almost everybody has seen a Mallard. Their range is Holarctic, which means that they occur around the world in the northern hemisphere, across Europe, down to where the tropics start in North America and Asia and down to the Sahara in Africa. I wouldn’t be the least bit surprised to learn that they had spread beyond that as well. Mallards are a dabbling duck, which means that they don’t normally dive underwater for their food (though they do dive on occasion). Instead, they tip up, stretching their necks to grab plants, insects, crustaceans and virtually anything else they can get. I have seen ducklings diving completely underwater (and staying down for fifteen seconds) but if they were diving for fun or for food I don’t know. 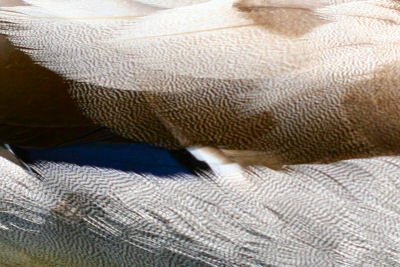 Mallards migrate when forced to by freezing water. In cold winters around here they are often found in small creeks that run fast enough not to freeze. As the ice retreats, the Mallards return. Their flight is strong with regular wingbeats and they can launch themselves directly into the air at a moment’s notice. So the next time you see a Mallard and sigh, wishing it were a rarer species, remember that Mallards weren’t always so easy to find, and be grateful that the beautiful bird you see in front of you has survived not only the hunters’ guns but being raised in a single-parent pond as well! Mallard duckling: certainly not a trash bird! And now for something completely different: I love monkeys! There is a book by Witmer Stone – something like “Bird Studies at Old Cape May” – that was published in the early 20th century. One of the interesting points in reading the book is seeing how much the populations of some species have changed. 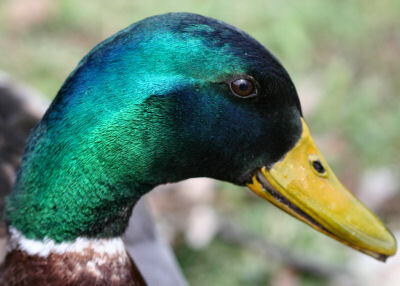 In his day, black ducks were very common, but mallards were declining and difficult to find. Of course, the situation is reversed now. @John: I would just leave her be. Unless she seems injured there is no reason to interfere. 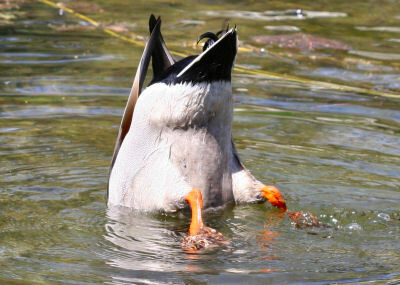 > I have seen ducklings diving completely underwater (and staying down for fifteen seconds) but if they were diving for fun or for food I don’t know. I know. 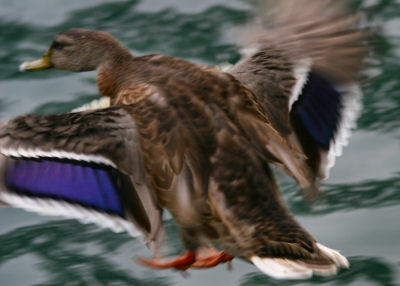 I once watched four Mallard ducklings repeatedly diving straight down through four feet of clear water to scavenge a carp carcass on the bottom. Jericho Park, Vancouver Canada.